Jill Scipione's work is about the human condition; the situation of the soul and flesh described using the physicality of drawing and painting space. The paintings gathered under the title Psalms and Prophets have direct connections to specific phrases and passages in the Biblical texts, yet also in each, the artist uses these texts as inspiration for the building of a system or specific form in paint that would have its own meaning and object-quality. Each painting then becomes a physical model that embodies or serves as a companion to the textual concept. 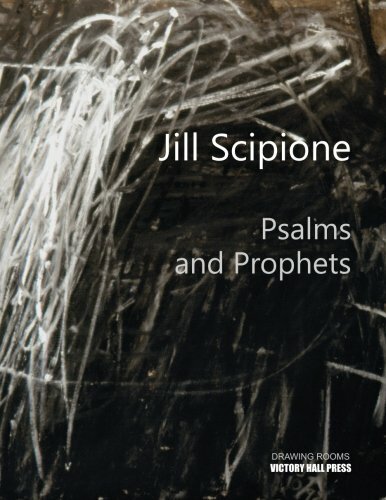 In the early 1990s, Jill Scipione began a series of works with the intent of creating a space descriptive of concepts from passages of the Biblical Psalms and Prophets, particularly Isaiah and Ezekiel. These paintings came to be about light traced into the dark; her drawing line becoming a painted trail of movement, creating and diffusing figures, forms, and atmospheres. Four or five distinct groupings of work emerged, including themes of wheels, vehicles, objects/structures, veils, and eventually a set in which parts of figures from Giotto's early Renaissance paintings are rephrased. The entire series consists of about forty oil on linen or canvas paintings, varying in size from 6 x 5 ft to 5 x 4 ft with additional smaller works and drawings. To achieve the dense, physicality of the surface that these works required, Scipione used a heavy-bodied oil paint with a stand oil medium to create a tough, visceral stroke. Typically, each work was planned and developed for days ahead of when she would enter the studio to paint and then the actual painting came together with great energy and urgency- sometimes in a single day's work - all the aspects having to interact while the surface was wet and malleable. As the series continued she sometimes introduced other materials: marble dust, fibers, and grit, into the paint to achieve the textures and surfaces that the works required. About the AuthorJill Scipione was born in Ashtabula, Ohio, on Lake Erie. She received early art training at the Butler Institute of American Art when her family moved to the Youngstown area and majored in painting at Carnegie-Mellon University. She lived in Boston, the New York City area, and Pittsburgh before returning to Ohio in the early 1990s. She started working on the Psalms and Prophets series there in a studio shed with funds awarded through a Pollock-Krasner grant. Her work has been seen in galleries, museums, and art spaces in New York City, New Jersey, Boston, Santa Fe, and throughout Pennsylvania and Ohio. Scipione began working from museum biology and anthropology collections at the Smithsonian and other museums in the mid-90s, incorporating the imagery into her artwork. In 2007, she began an ongoing drawing study of human skulls of historic peoples from global, anthropological collections. Her most recent series of works returns to forms from Renaissance paintings as their source. She is active as an artist and arts organizer in the NY/NJ metropolitan area, managing the Rainbow Thursdays Artists program for developmentally disabled adults and a drawing program for special education students and their families.